I realize there is a whole segment of the American population that is going to be instantly turned off by the title of this post. 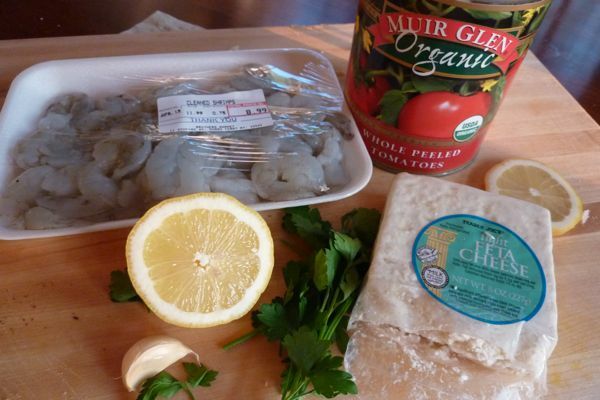 Seafood and cheese — that’s just…wrong. But this recipe might just change your mind, as it did for me the first time my friend Melissa made it for us about a decade ago. Melissa, co-author of The New Brooklyn Cookbook, was one of my first kitchen heroes — one of those friends who would serve me something that I would then pass off as my own to the next dozen dinner guests I cooked it for. (Oh, this? Just something I came across…hmm where was it???) We’ve served it to bosses and in-laws, neighbors and siblings. And, of course, to our children — even when it meant cleaning the sauce off a few pieces of shrimp before serving. To make: Preheat oven to 425°F. Saute two minced garlic clove in olive oil in an ovenproof skillet set over medium heat. Add one 28-ounce can of tomatoes (drained, very important), and stir, breaking up tomatoes. Cook for about 10 minutes. Nestle in a pound of shrimp and cook until shrimp starts to turn pink all over, about 3 minutes. Sprinkle two-ish handfuls of feta on top and bake in your preheated oven for about five minutes until cheese is melty. Remove from oven, add chopped parsley and the juice of half a lemon. Add salt and pepper to taste. I made this last night, and it was delicious. I’m definitely adding this to the rotation, thanks for the recipe!! Kate – that’s awesome! Hope the kids liked it, too! There is a very similar recipe in “the Food You Crave” cookbook. It is the most wonderful thing. No lemon in hers. I like that idea and will be trying this version tonight. PS, I am new to this blog and I LOVE it. Just made the pea dip yesterday and my 5 year old is addicted. I also miss Cookie so so so much. Made this last night from the DALS cookbook–major hit with the family and EASY!! looks fabulous. what do you serve this with? pasta/rice/crusty bread? Making this now, it looks and smells wonderful. Paired with Macrina bread from Seattle, cheese and a ginger beer martini. Happy Friday! and thanks for the inspiration. I am SO making this! Luckily both my boys love shrimp and feta cheese. You have the best recipes, Thank you! Picked up your book today, this was the first recipe that caught my eye. Family LOVED it!! I read your newsletter. Do I win Placemat Art? Also, I LOVE this recipe. I am making this ALL the time lately. I either add a handful of sliced kalamata olives or serve it with olive bread. Can’t lose! Wow. Just saw your website for the first time yesterday. 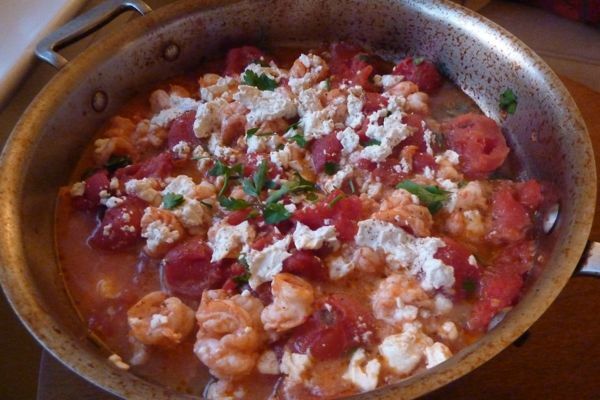 Saw this recipe and thought, hmmm, we have shrimp in the freezer, tomatoes in the closet, and I think we even have feta in the frig! Went home excited to make the dish. Husband and I gobbled it up, Delicious and simple (and attractive, even). Low calorie, low glycemic index, fast, ymmy…Yup! Definitely will be in our rotation. THANK YOU! I will bookmark your site – so excited to find more great info and recipes to try! I made those with some orzo pasta and it was AWESOME. This was my first attempt to make one of your recipes. I made this shrimp scampi last night, and it was SO GOOD. We ate every bite. I will definitely be making this again and adding it to the rotation. I am now obsessed with your blog, and I can’t wait to try more recipes! Thanks! Greeks say that parsley goes everywhere, but you can use oregano or thyme too. Great recipe! I’ve made this three times now for just me and my husband after the kids are in bed. Each time I pull up the recipe here I get such comfort out of the visual of how few ingredients there are. Didn’t have fresh parsley last night but it was just as delicious. The lemon is a stand-in for that bright flavor and we almost always have one lemon languishing in the fridge. We keep it free of any bread or noodles but no one minds getting a spoon out when it’s brothy. Great meal!